The Commonwealth of Australia is a Federation with six states – New South Wales (state capital Sydney), Victoria (Melbourne), Queensland (Brisbane), South Australia (Adelaide), Western Australia (Perth) and Tasmania (Hobart) – and two territories, Northern Territory (capital Darwin) and the Australian Capital Territory, where the federal capital, Canberra, is situated. 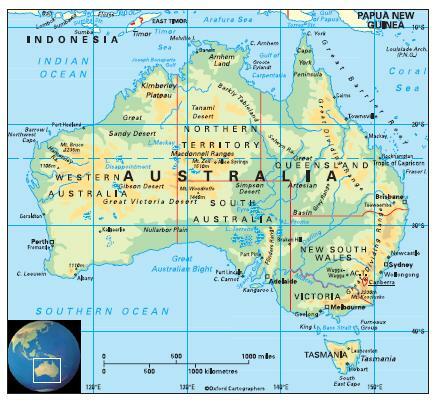 The term ‘Australia’ is derived from Terra Australis, the name given to a southern landmass whose existence geographers deduced before it was discovered. Papua New Guinea (to the north) and New Zealand (to the east) are Australia’s closest neighbours. To the south lie the Southern Ocean and Antarctica. The Tropic of Capricorn almost bisects the continent, running just north of Alice Springs, Australia’s central settlement. The subtropical areas north of this line have summer rainfall and dry winters. South of the Tropic, the rest of the continent and Tasmania are temperate. Continental considerations affect this basic pattern, most coastal areas having some rainfall, whereas a large tract of central Australia has less than 300mm p.a.. Drought and consequent bushfires are a serious problem. This pattern of rainfall will be dramatically affected by occasional La Niña events which occur in the central and eastern Pacific Ocean causing the sea to cool and increasing the probability that strong cool onshore winds will bring heavy rains to the eastern regions of Australia, as occurred from November 2010, when there were devastating floods first in Queensland, then in Victoria. The most significant environmental issues are soil erosion and desertification; loss of the natural habitat of many unique animal and plant species due to increases in agricultural and industrial production; and damage to the Great Barrier Reef, the largest coral reef in the world, due to increased shipping and tourism. 23,050,000 (2012); population density is one of the lowest in the world; 89 per cent of people live in urban areas and 58 per cent in urban agglomerations of more than a million people. The population growth rate stood at 1.4 per cent p.a. between the years of 1990 and 2012. In 2012 the birth rate was 13 per 1,000 people (20 in 1970) and life expectancy was 82 years (71 in 1970); life expectancy in the Aboriginal population was about 70 years. People of Asian origin comprise 8.7 per cent of the population and Aboriginal or Torres Strait Island peoples 2.5 per cent. Seven out of ten of the population were born in Australia (2006 census). Australia is classified as a high-income economy by the World Bank.